A couple of weeks ago I returned to where I’ve been on holiday for the last few summers, Fforest near Cardigan in South West Wales, which is a truly marvellous place to unwind and recharge the batteries while at the same time offering a fantastic place for the kids to enjoy. I’m not the sort of person that tends to return to places as I like to move on to somewhere new as there are after all so many nice places to discover but from the moment that I first came to Fforest and saw how much my kids enjoyed it I knew it would be a place I’d return to and each year the kids ask to return. I’ve also been there for a long weekend and managed to attend the Do lectures as well (which I really much get round to writing about at some point). As soon as you arrive after a long drive (and it doesn’t really matter where you are coming from it’s a long drive) you are struck by the space and the chilledoutness of the place. The staff are fantastic superbly laid back but very professional which is a tricky mix to pull off. You can’t take your car onto the site so it does mean you have to do a bit of lugging with your stuff but once that is done the feeling of space and peace takes over. There are several different fields, each one with different types of accommodation (and I can’t tell you how good it feels to arrive somewhere and not have to struggle to put up a tent) but the key is that whatever field you are in there are only a few tents, tippis or domes spaced around one or two edges a design means that you look out only onto greenery and there are wide open spaces for children to explore. Over the years they have cultivated the hedgerows to grow out between the tents creating a lovely atmosphere of open privacy. 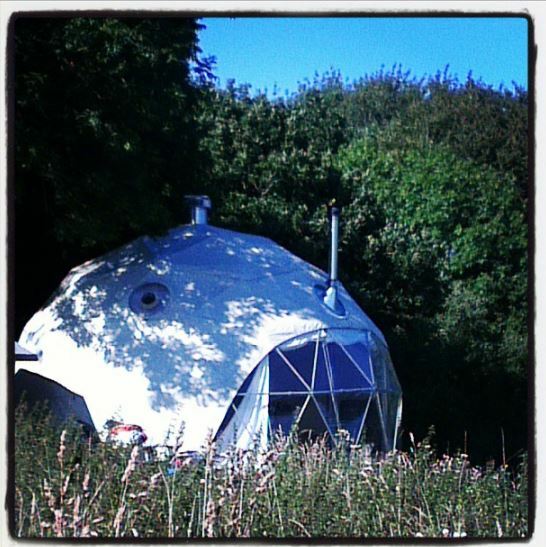 I’ve stayed in most of the different types of tent but this year I went for a dome as a treat and what a treat that was and it was perfect for us as the kids are much bigger now and we need more space. Whatever you stay in there is also a deck with chairs and beanbags and a cooking area which is a lovely place to relax, cook marshmallows over a fire and watch the sun set. The site also has a central lodge and the most fabulous little stone pub. There are numerous footpaths that head off into the local woodland that can take you to the nearest village, Cilgerran or down to a wildlife centre situated on the river Teifi from which there is path through the marshes down to Cardigan which makes for a perfectly safe cycle or leisurely walk. The area is perfect if you like being outside with walks, rivers, beaches, cycling etc all on your doorstep and Fforest link up with a local company Cardigan Bay Active to provide you with organised activities if you want to do that or you can just find your own way. Over the years we’ve been Canoeing, Sea Kayaking, Surfing, Tree Climbing, Coasteering and this year we had the most fantastic time canoeing up the river Teifi as well as taking a trip out into Cardigan bay seal and dolphin spotting. There are numerous beaches within easy reach many of which are sparsely populated even in the height of summer and if you like your mountain biking there is plenty of natural trails and I’ve also managed to sneak off for the morning and ride at Brechfa. Wales is very green and it’s green for a reason it gets a lot of rain and last year we did get a bit damp but this year the sun blazed and I really couldn’t have wished to be anywhere else. I’ll be writing a few posts over the next week on some specific things in the area that I enjoyed but the gallery below should give you a flavour of Fforest and the surrounding area which were all taken within 20 mins drive of the site.